Bowman Lake Campground is located in the North Fork area of Glacier National Park, approximately 32.5 miles north of the West Entrance. The drive to Bowman Lake is along a rough, dusty, dirt road with blind curves and limited pullouts, and passes through the tiny community of Polebridge and sections of the park that burned in 1988. The campground is located close to the shore of Bowman Lake and campsites are within trees for shade and some privacy. Tent campers looking for peace and quiet will enjoy Bowman Lake for its serenity and remote location. Pack bug repellent or head nets, as mosquitoes often take residence in the area. Potable water is available at water spigots in the campground, and there are vault toilets nearby. Day hiking opportunities abound near Bowman Lake for visitors eager to experience Glacier's wilderness recreational opportunities, including hiking, fishing, canoeing, and kayaking. Limited visitor amenities can be found in Polebridge. There is no gas available. 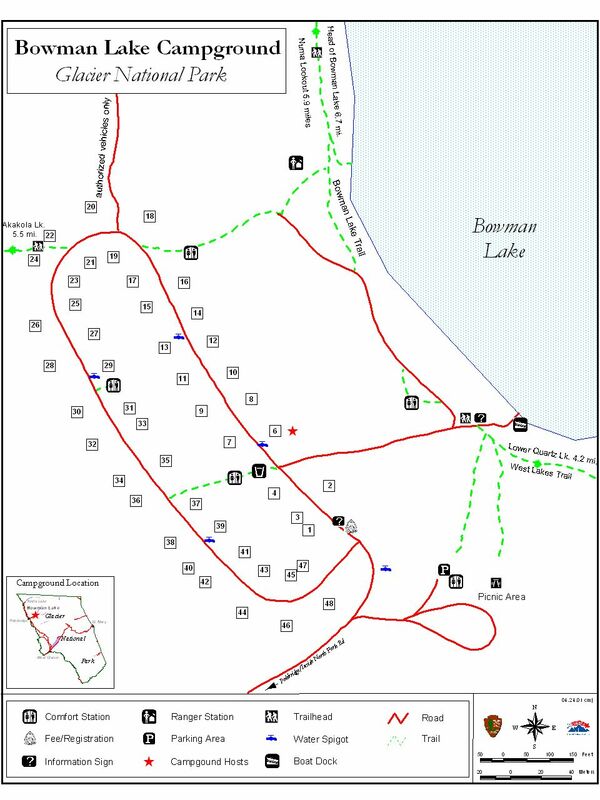 Vehicles over 21’ in length and/or vehicle- trailer combinations are prohibited at Bowman Lake due to the nature of the long, narrow, and windy dirt road to the campground, and very tight parking areas at each campsite. Sites are available on a first-come, first-served basis. Primitive camping is available in the fall, depending on weather and road conditions. Primitive camping is $10 per night. Water is unavailable during the primitive camping season and campers are advised to bring their own drinking water. The current month is always displayed, showing what days and times (in red) the campground filled. If the campground did not fill on a certain day, no time will be displayed. Use the drop-down menus to select a different month and year to see when this campground filled. Use Avg to display the 5-year average for the month selected.